. . . will be of interest not only to historians but also to Catholics currently striving to understand issues of control by the church hierarchy. . . this work is important to women religious who should put it on their required reading list. Re-entering these experiences renews an admiration for the overwhelming dedication, courage, and responsible actions undertaken by communities of religious women in implementing the directives of Vatican II. Re-entering these experiences also re-opens the wound of the continuing abuse and demeaning of women by the hierarchical system of the Roman Catholic Church. Sincere gratitude for Anita Caspary's willingness to be led by the Spirit and for her willingness to share the story. 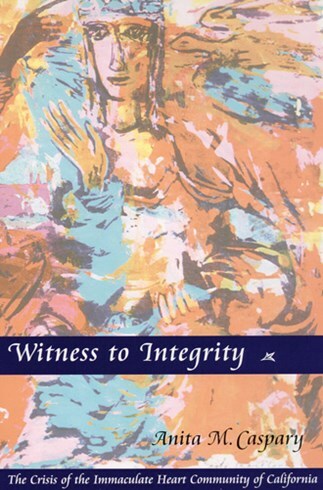 While its interest to students of religious history of canon law is self-evident, Witness to Integrity can also be highly recommended to readers with a general interest in education, women's studies, or the social/political history of the western world in the mid-twentieth century. Finally we have in print the story of one of the most important controversies in the post-Vatican II U.S. Catholic Church. Anita Caspary, who courageously and prudently led the Immaculate Heart Community during its painful struggle with the Cardinal Archbishop of Los Angeles in the 1960s, tells the story with grace, clarity, hope, and objectivity. This book is must reading for all interested in U.S. Catholic history and the role of women in the Catholic Church. The persuasion of a first-person narrative makes this a story captivating for upper level college students. Precise documentation makes this a useful resource for historians and graduate students. This eloquent book . . . is the story of why and how 350 courageous IHM nuns in California voted to dissolve their canonical ties to the Archdiocese of Los Angeles and to the Vatican and to create a new and independent non-canonical religious community pledged to serve the people of God and to fulfill the promises of the Second Vatican Council. Meticulously researched, carefully documented, and beautifully written by Anita Caspary, it should be eagerly and gratefully read by every serious minded woman in the Catholic Church today, and should be required reading for every new cardinal-elect before he receives his scarlet biretta from the hands of the Holy Father. Thirty years after the fact, many in our institutional church are still mired in issues of authority and control. Caspary's story is not only a witness to integrity. It is a beacon of hope and courage in a time of crisis. This is the tragic story of how Cardinal James Francis McIntyre, with the help of the congregation of religious, tried to destroy one of the most important and most effective religious communities of women in the United States. While the cardinal won his battle, the Immaculate Heart community continues to survive and to grow, but with the pain and suffering the community was forced to endure. It's a crime that calls to heaven for vengeance. Anita Caspary's important and anticipated account captures the challenges facing this vanguard confronted by long-established ecclesiastic authority. In the process, the Sisters of the Immaculate Heart of Mary bore the brunt of the opposition, made smooth the path for others, and added their eloquent appeal to the call for redress raised across the feminist spectrum. Caspary's autobiographical approach and the near-exclusive use of interviews and personal papers of FOCIS members as sources by authors of the Glenmary account, lend a valuable personal authenticity to each story. As a Council Father and a participant in the struggles of the IHM Sisters, this dramatic case history gripped me in a unique, poignant way. It erupts as the facts unfold, with passion, courage, determination, precisions. It called me to relive some of the basic issues emerging from Vatican II. This is the story of courageous women who embraced both the challenge and the pain in pursuit of their vision of Vatican II. The Immaculate Heart Community is reborn, blazing fresh trails, opening new possibilities for others to follow. I recommend this book to anyone who cares about our Church and is scanning the horizon for signs of new life. Readers of this book will come away with a clearer understanding of the struggles for organizational change that will insure dignity for women and other less advantaged groups in all social institutions.